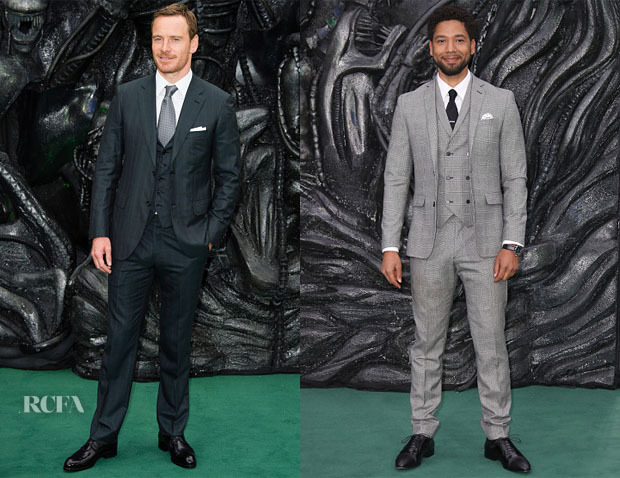 A few men joined Katherine Waterstone and Dakota Blue Richards on the red carpet for the world premiere of ‘Alien: Covenant’ in London on Thursday (May 4). Michael Fassbender: The actor looked sharp in a three-piece Brioni suit in a warm, dark charcoal hue. The tie struck me as a bit wide, but all in all, a handsome look for Michael. Jussie Smollett: Also going the three-piece route, Jussie buttoned up in this plaid gray double-breasted vest styled with matching sport coat and trousers. He accessorised with a Henry London watch. His pants could have been better tailored at the bottom, if we were to nitpick.